The phrase, old time pottery, often makes people think of the giant discount store that sells craft, home decor and specialty items. However, in the world of antiques, old time pottery refers to pottery from the Song, Ming and Qing Dynasties of the 11th to 19th centuries. This ancient pottery is recovered by divers as they excavate shipwrecks in the South China Sea which was a main shipping route linking China to India from the 4th to the 19th century. With the recommendation of the Malaysian authorities, The Nanhai Marine Archaeology Sfn. Bhd. was formed to find and excavate historical shipwrecks. The company, which is completely independent and self financing, does extensive underwater exploration and excavation. When shipwreck is found, the researchers carefully recover the ancient artifacts and document each piece. Once the site has been successfully excavated, researchers painstakingly search for the kilns where the old pottery was made. By comparing the kilns wasters with their artifacts, the researchers are able to precisely identify where the recovered items were made hundreds of years earlier. The national Museum of Malaysia is given all of the unique and single artifacts along with thirty percent of all the other recovered items. Nanhai Marine Archaeology is then permitted to sell their portion of the recovery in order to finance future projects. Many International Museums have displays of their recovered pieces as reference material because of the authenticity and precise dating of the artifacts. In addition, there are many books, reports and catalogs that substantiate their ongoing research and recoveries. It is known that earthenware has existed for 10,000 years. This ancient pottery was usually fired in a basic open pit. Early earthenware pieces were simply formed on a wheel or made by rolling the clay into strings and laying them on top of one another to form the piece. Many of the earthenware pieces excavated from 14th to 16th century ship wrecks generally have remnants of food on them. 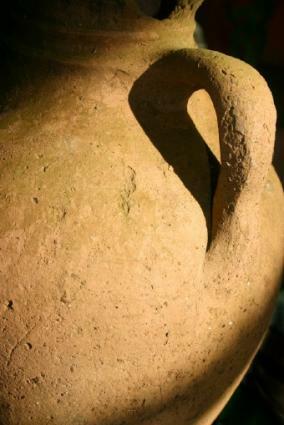 It is believed that the earthenware of this time was not made for export because of the limited number of pieces found. Motifs and designs were painted with black iron oxide and then covered with a clear permanent glaze that protected the decorations. The Under glaze method was popular from the 14th through 16th centuries in Vietnam and Thailand and is believed to have originated from Chinese potters. Although black Under glaze pottery from that time is rare, pieces have been found on several shipwrecks including the Turiang, Longquzn, Singtai and Xuande. Collectors should be aware that there are many reproduction pieces made in Thailand that are often sold as genuine antiques. A large Chinese pottery complex located in Jiamgsu province is well known for its teapots. Antique Yixing teapots that are recovered in the shipwrecks were made with granular clay which is no longer available. The beautiful purple clay that is still used today is a mixture of the purple, green and red soil of the area. Antique Yixing teapots were all handmade. Many tea lovers consider Yixing teapots to be amongst the best teapots of the world. Other types of Yixing wares include covered boxes, bowls and garden pots. Not all Yixing ware pieces were made using purple clay but all were handmade using porous granular clay. Old time pottery recovered from these historical shipwrecks gives us an insight into the ancient maritime trade of China and Southeast Asia.